If you’re a fan of corn nuts, you already know that they aren’t really nuts. 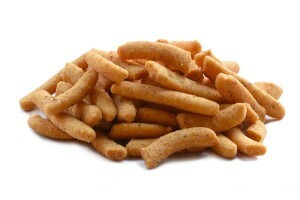 You also know that they are a fantastic, flavorful, crunchy snack. If you’ve never tried this unique snack, you’re missing the pleasure of enjoying a highly popular, delightfully fun and flavorful snack. Thanks and appreciation go to Albert Holloway of Oakland California for his role in introducing corn nuts to the United States. Just the preparation process for this snack makes them interesting enough to give them a try When corn kernels are harvested and cleaned, they shrink. Before the kernels become the crunchy treat that people have come to love they have to be rehydrated. This is done by soaking the kernels in water until they return to their original size. This is the first step in the preparation process when making corn nuts. After the soaking process is complete, the kernels are deep-fried or roasted. This process gives the kernels an intense crunchiness. Roasted corn kernels have a distinctive, nutty flavor. The corn nuts that are eaten today are not identical to the ones Mr. Holloway first made. In 1936, when Mr. Holloway invented corn nuts, he used kernels from sweet corn. Sweet corn kernels are not impressively large in size. He later learned about Cusco corn from Peru which produced one-inch kernels. After extensive research, he developed a Cusco hybrid that could be grown successfully in California. In 1964, a larger corn nut snack was made available to the many fans who had become infatuated with this incredible snack. Today, there is an extensive variety of corn snacks available. In addition to various flavors of corn nuts, there’s also tantalizing corn sticks and corn nuggets you can include in your snack selection. Buying bulk corn nuts in various flavors is one way to assure your snack time won’t become boring. It may be difficult for you to give one specific corn nut flavor the distinction of being your absolute favorite. With the diversity of flavors, you can select a variety of corn nut that appeals to whatever snack craving you are trying to satisfy. Roasted Salted corn nuts are a simple, yet tasty and satisfying snack. This variety offers intense crunchiness, a notable nutty flavor and a hint of saltiness. It’s a popular flavor among kids and adults. At the other end of the flavor scale, there are spicy corn nuts. Their tantalizing flavor is achieved from the paprika, dehydrated onions and garlic, concentrated lemon and flavorful sea salt that make up a portion of the ingredient list for this exciting snack. If you want an exciting, yet not-so-spicy snack, the BBQ flavor may be just what you’re looking for. The natural flavors combined with sea salt makes this a pleasantly satisfying treat. Unique nutty, crunchy, cheese corn nuts are a very popular flavor. Earthy, slightly salty and large enough to be the star attraction in a trail mix, giant toasted corn nuts are bursting with flavor. Their giant size assures you of abundant flavor and intense crunchiness. 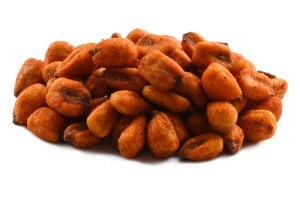 It can be advantageous to your budget to buy corn nuts wholesale. This will enable you to keep a large supply on hand for grab-and-go snacks, to add to a trail mix, to enjoy while watching TV or to offer as a snack at your next party. 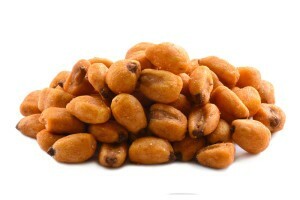 Corn nuts are high in carbohydrates and low in simple sugars. Being low in simple sugars makes them a viable snack option for those on a diabetic diet. They are also a source of iron and protein. If you’re looking for a snack that can support heart health, these tasty, kernels contain unsaturated fat which helps lower cholesterol levels. Many people fail to get the recommended daily value of fiber. Corn nuts contain fiber and are a fun, flavorful snack that can help you reach your target fiber percentage. Corn sticks are a wonderfully crispy treat that can transform a mundane snack time into a tantalizing adventure. The basic ingredient in corn sticks is yellow Masa flour. It is the Masa flour that contributes to the nutritional value of corn sticks. Cajun corn sticks and Cajun chili lemon corn sticks provide a percentage of the daily value of carbohydrates. They also contain fiber, protein, vitamin C, vitamin A, calcium and iron. In addition to their nutritional benefits, corn sticks are a uniquely textured, flavorful treat. Corn snacks can be enjoyed by the handfuls or added to a snack mix. They’re a unique diversion from sweet snacks, soft snacks or chewy snacks. Some snacks that you hope will satisfy your craving for something crunchy turn out to be disappointingly wimpy. Corn snacks provide you with an intense crunch that you’re sure to find satisfying. A hot and spicy corn snack can wake up your taste buds and possibly test your endurance. Corn, also known as Maize, was first domesticated by indigenous people in Mexico over 9,000 years ago. From Mexico it made its way to the Southwestern United States. About 1000 years ago, the Indians brought corn with them as they migrated to North America. When Columbus made contact with the Indians living in North America, he was introduced to corn. Corn was a major part of the native people’s diet. In ancient times, corn was the most cultivated crop in America.